The Kalamazoo Wings are members of the ECHL. This version of the K-Wings actually began in 1999-2000 as the Madison Kodiaks in the United Hockey League. After the IHL's Kalamazoo Wings franchise suspended operations, the Kodiaks were quickly purchased and relocated to Wings Stadium. They assumed the K-Wings nickname and brought back the original color scheme upon their arrival. After nine years in the UHL, the K-Wings switched to the ECHL, where they've been ever since. In 2010-11, the K-Wings were the secondary affiliate of the New York Islanders. Nick Bootland, a former K-Wing himself, was back behind the bench. Paul Pickard, former commissioner of the IHL, was team president. Kalamazoo had a fine season in 2010-11, capturing the North Division crown. Their 40-24-2-6 record was seven points better than second place Wheeling, but nine points behind league-best Alaska. They had the third best offense that year, scoring 255 goals. The K-Wings were led by longtime minor league veteran Kory Karlander. Karlander had 34 goals to go with 80 points. Two other players had over 30 goals, Trent Daavettila and Andrew Fournier. Patrick Taylor and Justin Asselin were the other players who scored at least 20 goals. The K-Wings were okay on defense, allowing 225 goals, 11th-best in the league (pretty defensive-minded league!). Ryan Nie was the #1 netminder in Kalamazoo that year, going 30-16-5 with a 2.80 GAA and 2 shutouts. His main backup was Riley Gill, who went 10-7-3 with a 3.05 GAA and two shutouts. Garrett Zemlak was the other netminder used that year. Kalamazoo got on a hot streak in the Kelly Cup Playoffs that year. After disposing of the Florida Everblades in four games (best-of-five) in Round One, they swept aside Reading in four straight in Round 2. In the semifinals, Kalamazoo faced the Wheeling Nailers (coached by ex-Icehawks coach Stan Drulia). After falling behind 2-1 in the series, the K-Wings ripped off three straight wins to advance to the Kelly Cup Finals for the first time ever. Their luck ran out, as they faced an even hotter team, the Alaska Aces. Alaska took both games in Anchorage, and except for a Game 3 loss in Kalamazoo, zipped by the K-Wings in five games to win the Kelly Cup title. The program is small, about 35 pages and compact. On the other hand, it's all in color. Plenty of advertisements and articles about the K-Wings and the ECHL. Advertisements include Celebration Cinemas, Auto Owners Insurance and WWMT TV3, a local CBS affiliate. The roster booklet is about four pages and includes stats and pictures of the K-Wings roster. Both came with a roster sheet with up-to-date statistics and standings. 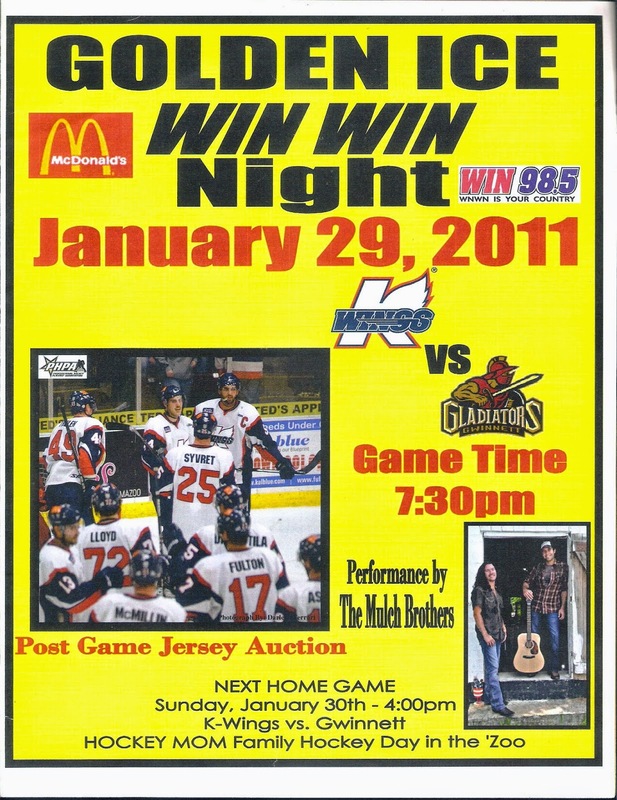 Both the program above and the roster booklet are from the game against the Gwinnett Gladiators on January 29, 2011. This was the first K-Wings game I ever went to. I lost both the Port Huron Icehawks and Flint Generals, and wasn't interested in going to Michigan Warriors games, so I decided to go on a few "road trips" to places I haven't been before, like Kalamazoo and Fort Wayne. As you can see on the booklet, that night's game was the annual "Golden Ice Night", in which the ice was dyed yellow and proceeds went to the Ronald McDonald House Children's Charities. (PS: Spare me your yellow snow jokes, lol). Pretty fun night of hockey, I really enjoyed Wings Stadium. It's been kept up nicely, but also has that "old school" charm to it. Not a bad seat in the house either.